Burma's opposition leader Aung San Suu Kyi was finally released from house arrest in Rangoon at around 5 pm on Saturday, welcomed enthusiastically by a wide public still angry and disappointed by the results of Sunday's election. “Long live Daw Aung San Suu Kyi,” cheered several thousands of her supporters near her house on University Avenue in Rangoon, in welcoming their leader, who has continued to inspire Burma's oppressed people with her non-violent democratic struggle against the rogue regime throughout the past two decades. “I can't describe how happy I am. I am so happy. She is our savior because she is the only one who can do what's best for the country,” said an old man who had waited near her house for news of the release since early this morning. Several of her supporters waiting near her house were seen breaking into tears of happiness when they heard the news of her release. Some also waved to the Burmese soldiers who left the compound, which has been a prison for the Nobel Peace Prize laureate for 15 years of the past 21 years. At 5:45 pm local time, Suu Kyi appeared before the crowd—estimated to number at least 10,000—to give a ten-minute speech. “We have not seen each other for a long time. There are so many things to talk about,” Suu Kyi said to the crowd, which responded with loud cheers and clapping. Dressed in a light purple blouse and urging the crowd to calm down, she made a peace sign with her fingers. She was also seen taking a flower from a supporter and putting it in her hair. Even after she went back into her compound, thousands of people refused to leave, hoping to have another glance of their leader. Her release came five days after the country's military regime held an election on Sunday marred by reports of widespread vote rigging. The junta's proxy party, the Union Solidarity and Development Party (USDP), was officially credited with winning 80 percent of parliamentary seats, despite strong popular opposition. “She will draw huge crowds and receive strong public support as she did when she was last freed,” said Tin Oo, Suu Kyi's deputy and the vice-chairman of her National League for Democracy (NLD) party. The NLD was officially disbanded after failing to register for the controversial election, which it boycotted on the grounds that it was held under undemocratic conditions. Although the party leaders continued to carry out party activities and gatherings, the junta has not yet outlawed it as an unlawful organization. It remains uncertain how much freedom the regime would grant her even though she was supposed to be unconditionally released. “The release shows that the government is quite confident of its control of the country because there is a lot of public resentment against vote fraud, which has been clearly exposed,” said Aung Naing Oo, a Burmese political analyst based in Thailand. The 65-year-old Nobel Peace Prize laureate has been released twice before during the 15 years of the past 21 years that she has spent under house arrest. In August 2009, Suu Kyi's house arrest was extended by 18 months after she was convicted of harboring an American who swam uninvited to her lakeside home. The daughter of Burma's independence hero Aung San is expected not only to reconsolidate her party but also to reach out to a splinter group that formed a new party to contest the election, which the NLD refused to participate in, as well as other opposition groups that took part in the polls. The leaders of the breakaway party, the National Democratic Front (NDF), said that they are willing to cooperate with Suu Kyi, but are uncertain if she will be willing to talk to them. “Since we are former colleagues, we believe she will offer to talk with us,” said Dr.
Obama, Laura Bush, the EU, ASEAN and Indian politicians welcomed the release of DASSK. Actually who wouldn't? CHINA! I am very impressed by her gratefulness, refering to the soldiers, who had "guarded" her compound so far. A Great Lady. How long do you think she will remain free? Sure as night follows the day, the "Generals" will find some spurious excuse to detain her again. Suu Kyi's release is just a public relations exercise for them to try to legitimise their so-called election victory. The Burma junta has no choice except to release her due to many pressures from out side. Outside pressure they do not care about, they care about inside presure such as ethnic problems which are escalating the fighting with the Tatmadaw, some of the Tatmadaw leaders do not want to fight among the same nation. Among the Tatmadaw a new generation of generals want Snr.General Than Shwe and Maung Aye to step down due to their age and some time their decision is not correct. For instance, the Border Guard Issue and allowing too much business opportunity to China and also these young generals they do not like Mandalay city becoming like a China sister city by settling Chinese with fake Burmese IDs and the immigration department is issuing Burmese IDs by taking bribes and this department is famous for corruption. The Young generation in the Tatmadaw wants the Tatmadaw to stay for national defense alone and does not want to be involved in politics. Aunty Suu Said “Please have understanding with each other. “Let's work hand in hand.” Read her lips. "United, Unison, Working Together". In the last fake election, one boycotted the election, another cast votes for the opposition, the third had to vote for Kyant-Phut as his boss ordered all staff to do just that. The fourth said "I am too busy to be interested in politics." Four people are divided. It is the antonym of unity. Aunty Suu knew that is why we are stiil under the military boot. Than Shwe knew all four divded people and he said "Thank you very much". If we do not want liberation or if we are happy living under the fascist military rule, we must defend the disunity among ourselves so that we can futher serve our master Ba Ba Gyi Than Shwe. What do we want? United or divided. The choice is ours. Aunty Suu could not do anything about it. Sorry. “Since we are former colleagues, we believe she will offer to talk with us,” said Dr. Than Nyein. Hell, you should go talk to her! 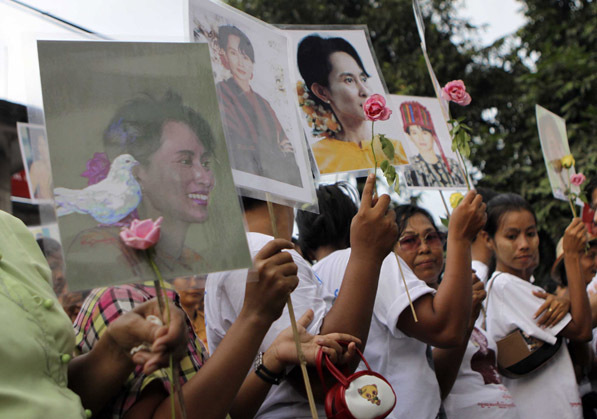 “Long live Daw Aung San Suu Kyi,” cheered the crowd. That is not ENOUGH people! It is time to form a tight cordon around her and the NLD and PROTECT them as best you can. Than Shwe has only half a million men compared to 50 million plus people to protect Daw Suu. People failed her - DID NOTHING - when she was ambushed last time by USDA members now USDP proxy party of Than Shwe's today. Daw Suu, please be VERY CAREFUL! Than Shwe has no use for you after having implemented his last step in his road map to hell. Hence, he would employ ELITE ELIMINATION policy. Gandhi was shot at close range by a Hindu. And Benazir Bhutto went into history untimely as well when a bullet found its mark. We ALL believe in your leadership. No need to show your face or give open speeches. And don't mingle in crowds, for your safety, please! We are very happy and excited to see Daw Suu freed. Please, Irrawaddy, more pictures or video clips for us who live outside Burma. Thanks. God, Allah, Jesus, Buddha and all the luck and natural phenomena, we have tried and try and will try..so please give Burma and the Burmese a chance to attain democracy, human rights and the road to development without any bloodshed. Please! HalaluYa! May the Burmese people become more free. Thank you Aung San Suu Kyi for your patience and strength. Many many loving greetings to the people of Burma and Rangoon and the Mahasi Sasana Yeiktha and all the Sayadaws. The NLD is a legal political organization registered in the junta's election commission office in the year 1990. As a matter of fact, the 1990 election commission was also formed by the same junta and previous formation order of election commission is not yet abolished, but under an undemocratic constitution the junta again constitutes a new election commission to hold an election which was held this month of 7th November, 2010, the NLD not participating. As such, the NLD still stands as a political party until and unless the junta has to officially notify that the NLD party office should close dawn and not be allowed to hold political activities. Otherwise, the NLD has rights to operate political activities although it did not participate in the last controversial election which was totally under vote rigging and not a free, fair and inclusive election under international standards. In such a situation the NLD has the right to exist as a political organization which also won a landslide victory in 1990 election. I was shocked. I use google.com.sg as my main source of news and I don't see any news about Aung San Suu Kyi released on google.com.sg. This is something strange about google.com.sg. I'm not going to use as my main source for news anymore. Daw Su kyi had already given the election results before the election, you do not care about it. I will repeat again she said that people have the right to vote as well as not to vote. This political version people do not understand, that is why many people formed parties and participated in the undemocratic election even some leading members of the NLD formed a party and participated and were defeated very badly. They should understand that a democratic election atmosphere must have freedom of speech, freedom of gethering, freedom of publication and distribution before the election, at the time when an election is held every polling station shall allow it to be freely observed, including the international media and observers, reporter from the press shall be allowed as election watch. Since there was no such kind of criterion in recent election, how do you expect to win, the whole situation was under the control of a dictatorship, so there will be vote rigging is a normal. No vote is better for us. Please refer to her as Aung San Suu Kyi, not Suu Kyi. Don't be jubilant, just not yet please. She could be arrested on any grounds again. Than Shwe has to show he has some laws operating at the moment. Of course, Daw Suu should tread softly and play the game wisely, with caution on her personal safety and security at best. Remember Gandhi and Benazir Bhutto; they didn't stand a chance at close quarters and when jubilation took the place of caution as well. Wai Hnin once said "they will never give up power voluntarily" and while echoing her I add here; either the gun comes into play or people power to the fore. Without one or the other Than Shwe would never let go of power and property gained via killing people and looting the country's wealth as well. In fact, the game has just begun and things will certainly get dicey. COMMITMENT, CONSENSUS, COOPERATION and COURAGE on the part of ALL count from now on for Burma's freedom and democracy. Daw Suu BE VERY AWARE of a dagger or a hidden gun for that matter! I will pray for Daw Su the best for her future! Daw Aung San Su Kyi,the only daughter of Burma, democracy icon, for your bravery and moral courage may you stay long alive, and please accept my heartiest salute.